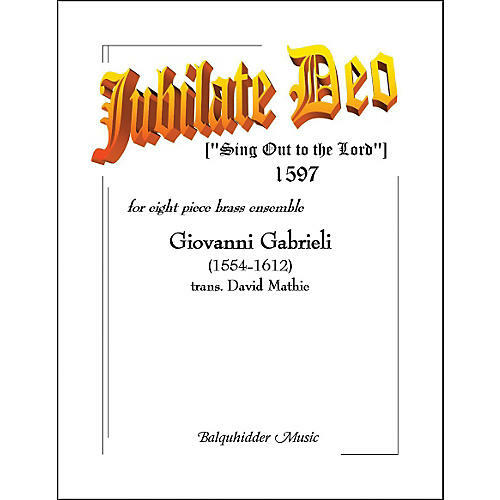 The most famous compilation of Gabrieli's choral and instrumental works is the Sacrae Symphoniae of 1597. From this collection Jubilae Deo (Sing Out to the Lord) was written for eight vocal parts: two soprano (most probably boys) and two contra-alto voices, two tenor and two bass voices. This transcription was taken from the complete works (Giovani Gabrieli Opera Omnia, American Institute of Musicology, Hanssler-Verlag, 1998). Editorial additions have been kept to a minimum: the slurs were taken from the text, while the dynamics are suggested by both the text and texture of the music. Musical interpretations should bear in mind that the work is vocal in nature and the tempo should reflect the fact that the original was performed in a very large acoustic space.